We are engaged in following stringent parameters of quality control for maintain the industrial standards. Our quality control unit is handled by expert professionals and they are very dexterous. They ensure the manufactured goods are energy efficient, compact in size and durable. 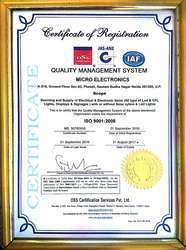 Our parameters of quality control are appreciated by our clients and they have earned us a huge clientele and reputed certifications. Our products are widely used in many industries for providing impeccable solutions for lighting to the customers.